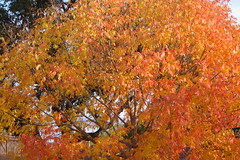 Autumn begins at the equinox, where the day and night will seem to be equal in length. During this season harvesting and eliminating can be seen as crops are brought in and leaves change colors and float to the ground. Creatures in nature tend to become more dormant and focused on preserving energy. Yang Qi (warmth, vibrance) goes inward, & Ying Qi (combination of air/ da qi and food qi/ gu qi) starts to grow. The fall corresponds to the “Metal element,” which has a quality of moving inward and represents the organs of the lungs, the large intestine, and the skin. The Lung and Large Intestine energies affect respiration, digestion, nutrient assimilation, and opening and closing of skin pores. They are also seen as the main organs for cleansing & detoxification. The Lung manifests in the nose and represents an entrance for clean air/ da qi into the body. The Large Intestine is seen as a segway for elimination of unwanted and unnecessary constituents from the body. The metal elemental energy is associated with processing and grief, letting go of old attachments and emotional baggage. Autumn is a good time to assess what we value and determine what is needed. As we do this we realize who we are without constraints, in effect remaining positive and calm. The Lungs are strong in the fall, but exercising less than the spring & summer is essential to store yang qi for the winter. This can be optimized by choosing exercises that do not require excessive sweating, focusing more on athletic skills & techniques, and practicing inward-directed movements such as Qi Gong, Tai Qi, Yoga and breathe work. In terms of recovery acupuncture, herbal medicine and tui na (Chinese clinical bodywork), accompanied by the philosophy of going to bed earlier and waking up later applies well in this season. This is also an excellent time to rejuvenate the lungs and to cleanse and nourish the skin by avoiding extreme dryness. Potential imbalances can be seen in the immune system/ wei qi, respiratory problems (allergies, shortness of breath & asthma), skin conditions and constipation. Foods that will help balance the metal element, nourish and protect body fluids/ jin ye, should be warmer, sweeter and slightly sour. But not pungent, acrid or spicy as these can be too dispersing & may cause damage to body fluids. Here is a general list of foods that can nourish the body during autumn: pears, white fungus, onion, garlic, chive, ginger, turnips, daikon; yellow, orange vegetables like carrots, yams, sweet potatoes; dark leafy greens, such as mustards, kale, chard and spinach; and rice, quinoa, amaranth or oats. Steam 10-15 minutes, cut into 3 equal parts and add local bee honey/ feng mi. This can also be cut into cubes, added to rice & water to make congee. As the air becomes cooler and our environments become more still, we can learn from the world around us. Turning towards introspection, and nourishment via breath, food and Oriental Medicine, we can allow an opportunity for conserving strength and a renewal of energies/ Qi. Pingback: Asian Medicine Wisdom for Autumn « Breathe. Connect. Be.